I think everyone knows about lemongrass tea. 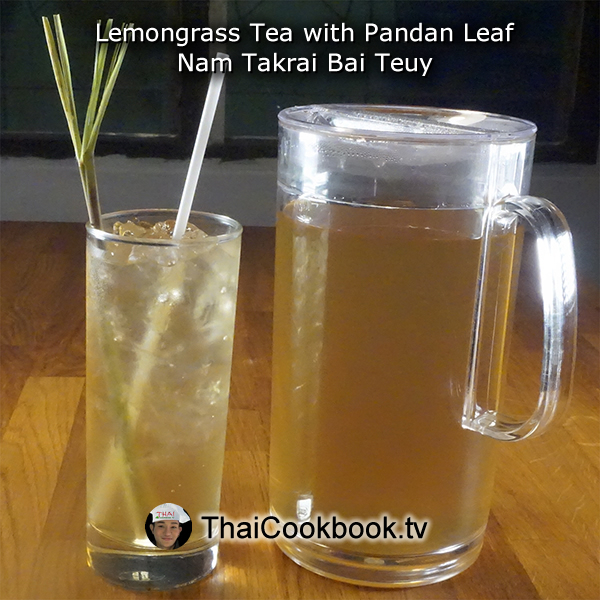 Nam Takrai Bai Teuy is another very popular iced tea drink in Thailand, made by boiling fresh lemongrass and pandan leaf together. Lemongrass has a light citrus flavor, as you probably know. The leaves of Pandan have an interesting flavor that is a little hard to define. 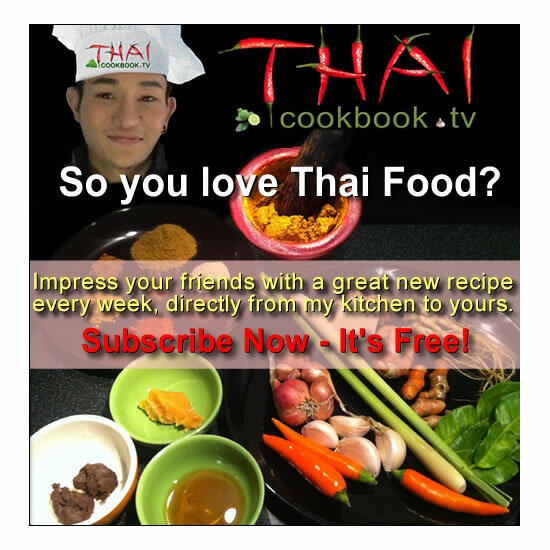 It is used to flavor many different desserts and foods in Asian cuisine. Some people say it is similar to vanilla, and others say it tastes grassy, like alfalfa hay. 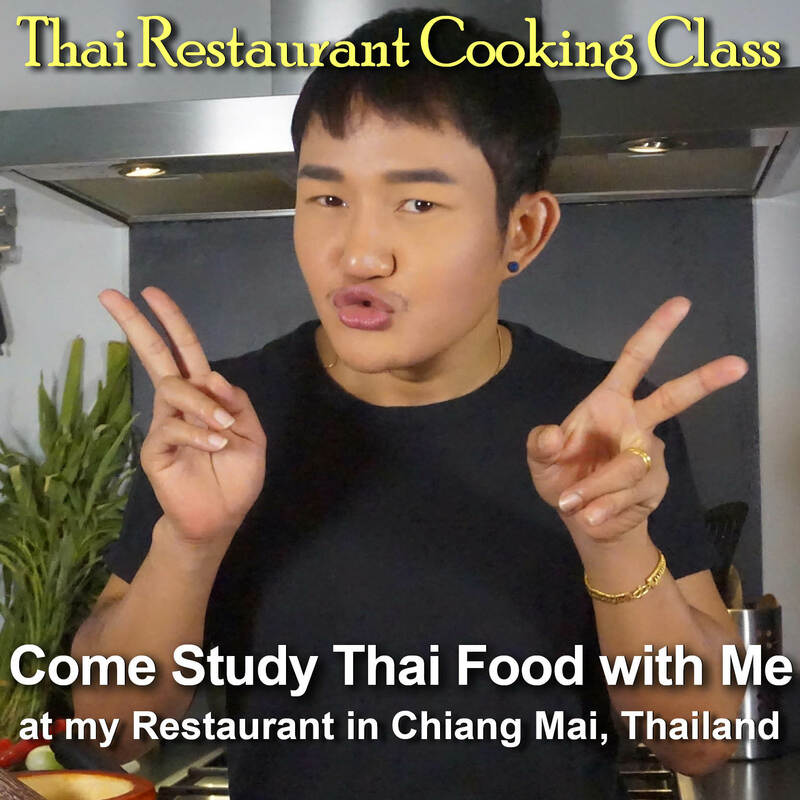 The flavor of these two herbs come together very well to create an authentic Thai taste. Like all our iced drinks, we serve it very sweet, but it can also be enjoyed without sugar or as a hot tea drink. What's in our Lemongrass and Pandan Iced Tea. How we make our Lemongrass and Pandan Iced Tea. 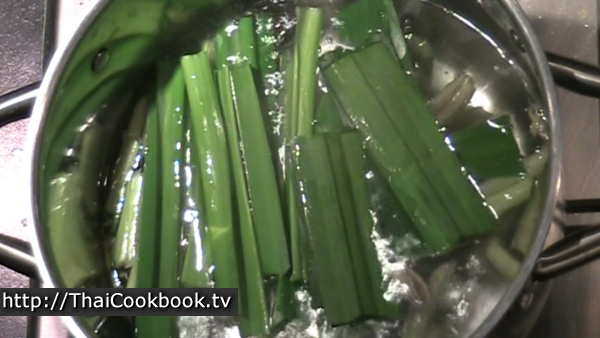 1) Cut the Lemongrass and Pandan leaves, then boil them in 1 liter of water for about 5 minutes. 2) Remove the cooked herbs, then add sugar. Stir until all is dissolved. Add cold water until you have 2 liters of tea. Remove from the heat and allow to cool completely. 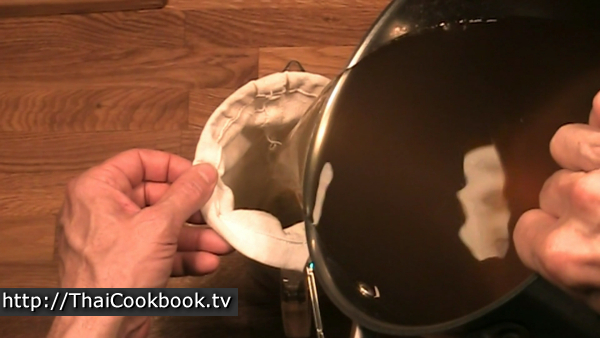 3) Pour the tea through a cloth filter or tight mesh strainer. Chill. 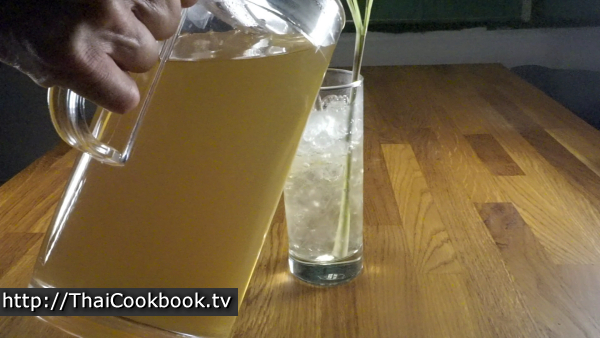 4) Serve over crushed ice, with a fresh lemongrass stalk in the glass. To make my tea I use about 4 large Pandan leaves. If you are not lucky enough to live in Asia where we can easily find it, then you can leave it out of this recipe and just use a few more stalks of lemongrass for a regular Lemongrass Iced Tea. 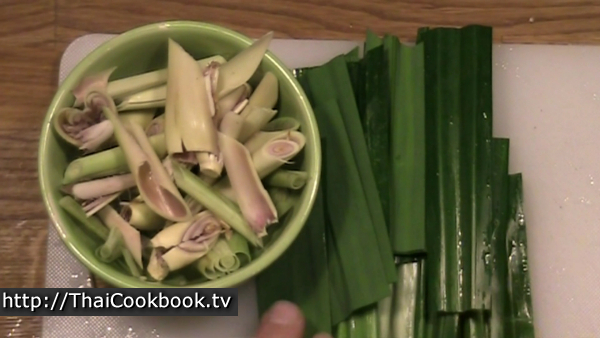 I pound the Lemongrass with a mallet so it's well broken up, then cut it into smaller pieces. 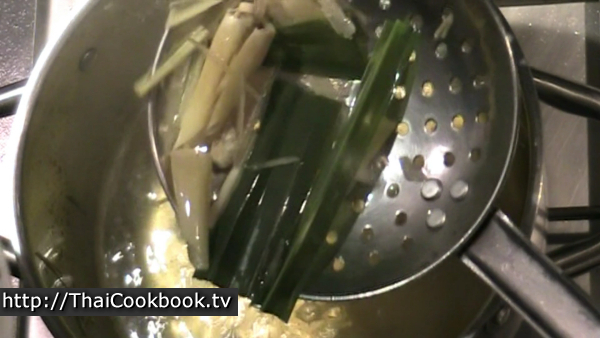 Also cut the Pandan leaves so they easily fit into your soup pot. 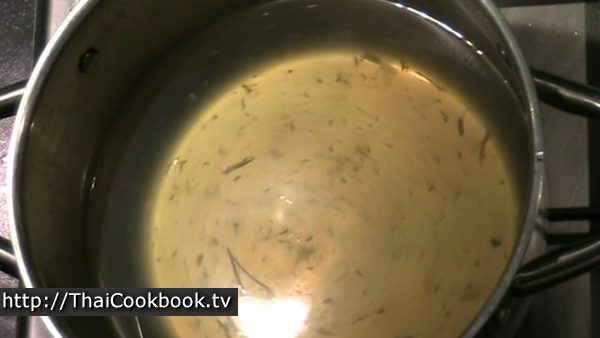 Boil about 1 liter of water, then add the herbs. Boil hard for about 5 - 10 minutes. Scoop all the leaves and fibers out as best you can. You want to remove them before adding the sugar. Keep the flame on so it stays hot, then add the sugar. Stir well until completely dissolved. Turn off the heat, then add cold water until the total amount of tea is 2 liters. Allow the tea to cool to room temperature. Pour the tea through a cloth filter or very tight mesh strainer to remove the small plant particles. Refrigerate in a bottle or pitcher with a tight lid. 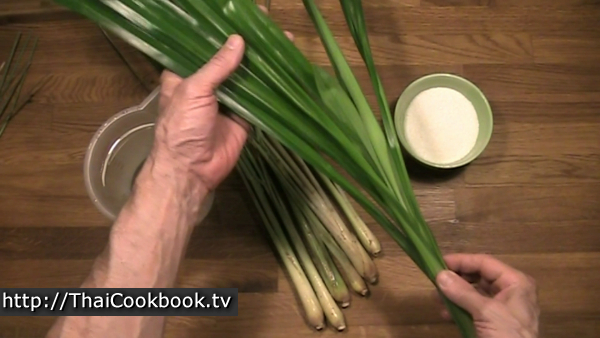 Serve over crushed ice with a thin stalk of lemongrass.